I have slowly been developing my video-making ability over the last few years. The available tools to make them are, first, so user friendly and, second, so readily available that it seems dumb to not pursue it. As a process-focused guy––in both my creative pursuits and my professional ones––I love the process of editing a video, as frustrating and as time-consuming as it can often be. However, whittling down ten minutes of footage into a five-minute video, complete with overlays and strategic cuts and jumps, is as rewarding as finishing a comic page, to me. I did a lot of videos of inking chapter 2 and a few for chapter 3. I backed off recording chapter 3 for a few reasons. One is that I was trying to get through the chapter as quickly as possible (without sacrificing quality), and as minimal as it seems, the minutes it takes setting up the camera and making sure the recording is going well, etc. can pile up over time, not to forget the actual editing process on top of that. Another reason is that chapter 2 ended in a cliffhanger, so the “spoiler” level was relatively low. Not that people tune in to my videos to learn the story being told as I ink, the moments I wanted the reader to experience on their own in this chapter was too high to risk “spoiling” in an inking video. For each page I did record an inking video for, I’ll be sure to include it in the notes to the page. This page was a task to draw, as they all are. Of course, drawing a crowd scene is in itself a focused and daunting task, but it’s fun enough because I get to draw a bunch of faces, which are my favorite things to draw in the first place. So, drawing a crowd was not the scary part. Drawing two crowd scenes wasn’t even the scary part. It’s that the first and last panels are, sequentially, very close together, like two frames out of a film. 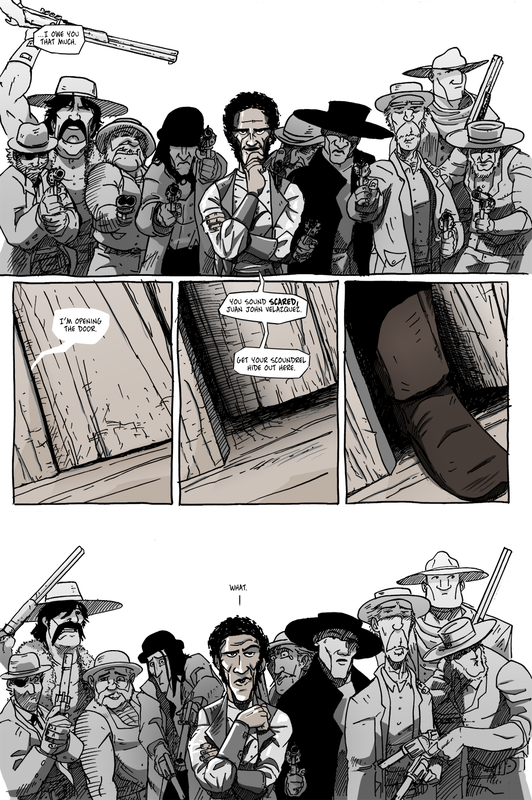 So, they not only had to be of the same crowd, but I had to make sure each person was in the same spot at the same height and were overlapping each other in the same ways and looked different enough from the first panel to be clear that they were reacting to Long John exiting the house. So, the second panel had a bit of the fun taken out of it because there was a lot of measuring and a constant bouncing back and forth between it and the first panel. The saving grace was, again, the faces, especially as they reacted to seeing a dude in his underwear. To that end, the hard work was worth it because this ended up as one of my favorite pages from the chapter.